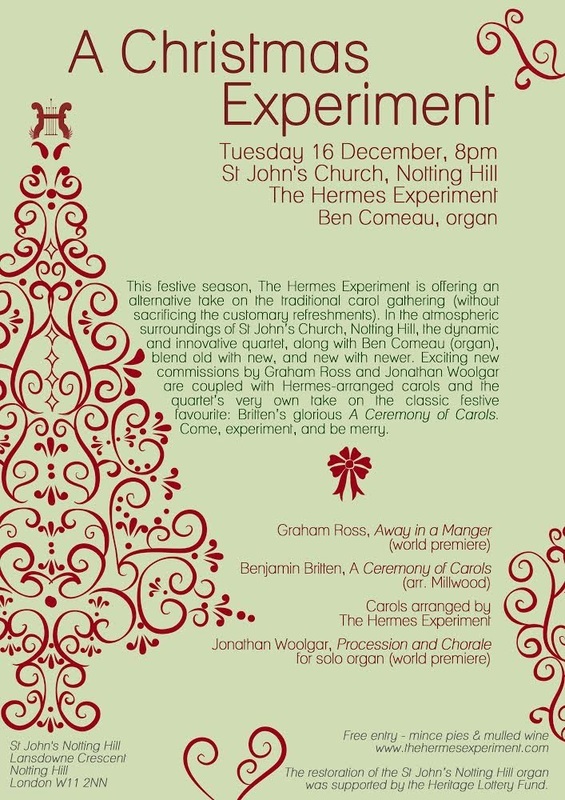 This festive season, The Hermes Experiment is offering an alternative take on the traditional carol gathering (without sacrificing the customary refreshments). In the atmospheric surroundings of St John’s Church, Notting Hill, the dynamic and innovative quartet, along with Ben Comeau (organ), blend old with new, and new with newer. Exciting new commissions by Graham Ross and Jonathan Woolgar are coupled with Hermes-arranged carols and the quartet’s very own take on the classic festive favourite: Britten’s glorious A Ceremony of Carols. Come, experiment, and be merry. 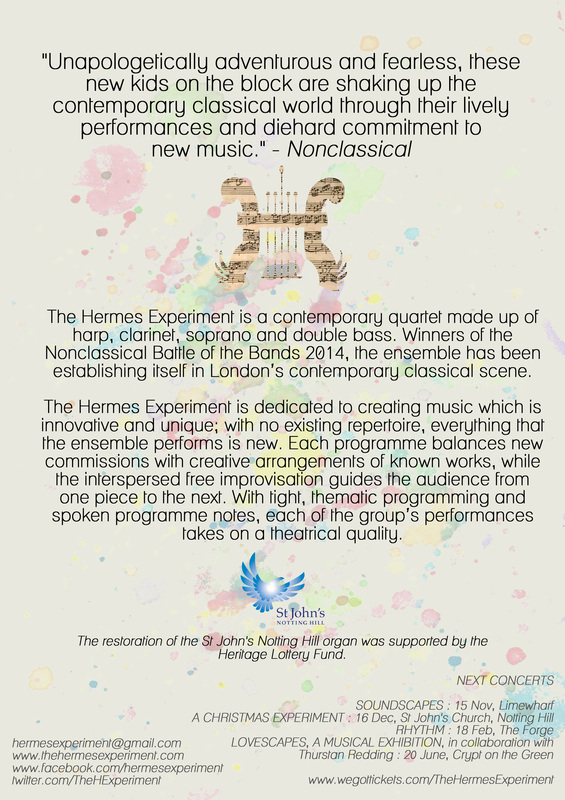 The Hermes Experiment is a contemporary quartet made up of harp, clarinet, soprano and double bass. Winners of the Nonclassical Battle of the Bands 2014, the ensemble has been establishing itself in London’s contemporary classical scene. The Hermes Experiment is dedicated to creating music which is innovative and unique; with no existing repertoire, everything that the ensemble performs is new. Each programme balances new commissions with creative arrangements of known works, while the interspersed free improvisation guides the audience from one piece to the next. With tight, thematic programming and spoken programme notes, each of the group’s performances takes on a theatrical quality. With thanks to www.organrecitals.com for listing this event.